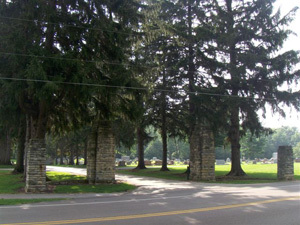 Mound Hill Cemetery operates under the laws of the state of Ohio. It is owned and operated by the City of Eaton. Day to day operation is managed by the Sexton in charge. The cemetery encompasses nearly 50 acres of established burial grounds located at two locations, 533 West Main and 130 Camden Road, across from historic Fort St. Clair Park. Mound Hill Cemetery has also purchased an additional 40 acres of ground for future expansion. Hundreds of burial sites are currently available for purchase at the Camden Road location. Contact the cemetery to make an appointment to purchase burial plots or make funeral arrangements.